I entered into the May Arts Ribbon Challenge. I submitted my idea and was sent some beautiful Silk Ribbons. You will have approximately one month to complete a craft project. Any craft design will be admissible, as long as you use each ribbon you selected. You are limited only by your own imagination. **Your idea must first be approved by The Ribbon Lady** But don't worry, I'm pretty easy going! The number of participants is limited to 25 people. The participants will not be selected on a first come first serve basis, but based upon your idea. So take your time before you send in your email, as you will have about a week to submit it. One winner will be selected and awarded 3 full spools of ribbon. Your choice! 10 additional entries will win a prize of 1 full spool of ribbon. To Enter: Email me at Bethney@mayarts.com with your idea & shipping information. If selected, I will mail out your ribbon to work with. When you have completed your project, forward me a photo with a brief description of your project. 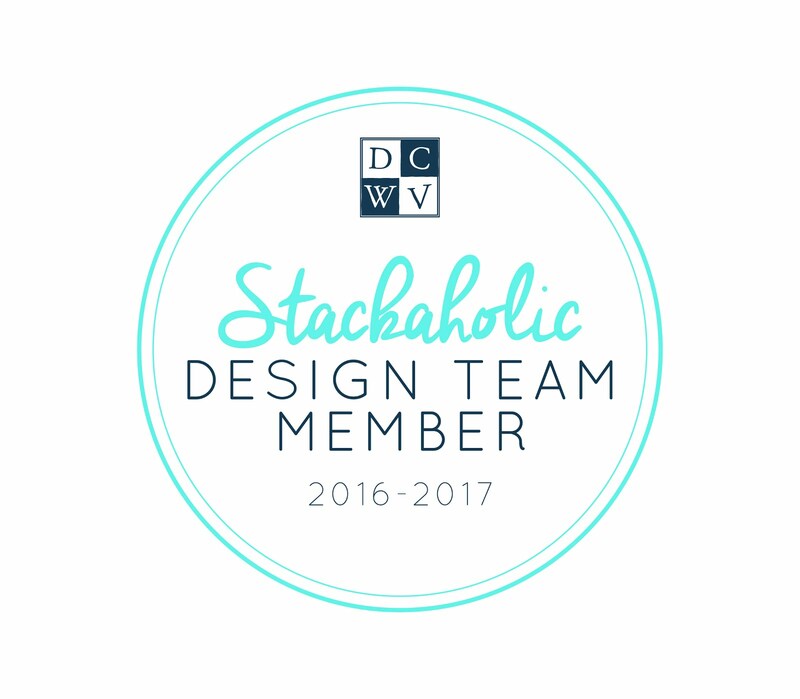 Or, better yet, send a video of your design & I will post it on the blog. Deadline: August 10th, 2012. Entries posted: August 13th, 2012. Winners announced: August 17th, 2012. 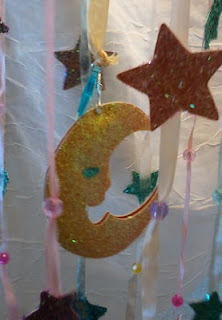 I created the moon and the stars with my Cricut. The Moon was cut from Paper Doll Dress Up. 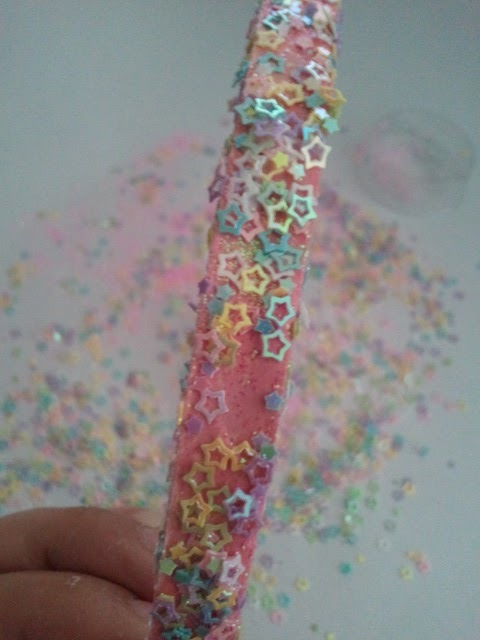 And the Star from Cricut Craft Room Essentials. I covered them in Recollections Tinsel Glitter. 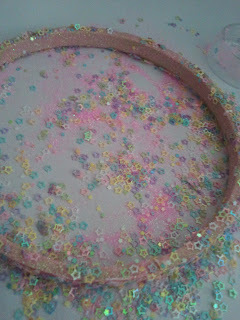 I covered an Embroidery hoop with Pink Fine Glitter (unknown brand) and Star Confetti Glitter. 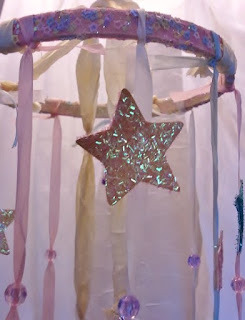 I used paper as a base and double stick taped down the paper to the hoop before putting the glitters on. I used Perfect Pearls and water to create a mist to use on the cream silk ribbon to crunch it up and give it a little shimmer and stiffness to hold the mobile and use as a hanging piece in the center. I used a need I made from wire to string plastic beads from my daughters stash on the ribbons. I spaced the beads 4" apart using 4 colors and 4 beads on each strand. 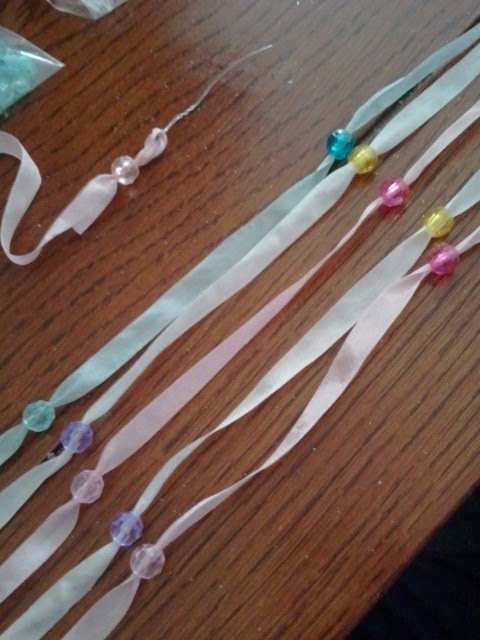 Some of the beads holes were bigger than most so I glued those beads with Ranger's Glossy Accents on to the ribbon. 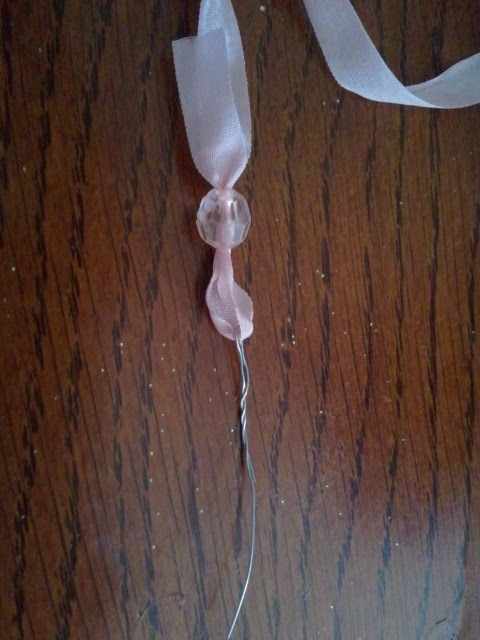 Each dangling ribbon is 24" long and spaced 1 3/4" apart. And just tied onto the hoop. The stars were all glued on to the ribbons with Glossy Accents.